Rob Lowe and Ellen DeGeneres are among those updating fans on the status of their neighborhoods. LOS ANGELES – Ash fell like snow and heavy smoke had residents gasping for air Monday as a huge Southern California wildfire exploded in size, becoming the fifth-largest in state history and driving celebrities from a wealthy hillside enclave. Tens of thousands have fled their homes as flames churn through foothill towns near Santa Barbara, the latest flare-up after a week of wind-fanned wildfires throughout the region. With acrid smoke thick in the air, even residents not under evacuation orders took the chance to leave, fearing another shutdown of a key coastal highway that was closed intermittently last week. Officials handed out masks to those who stayed behind in Montecito, an exclusive community about 75 miles northwest of Los Angeles that’s home to stars such as Oprah Winfrey, Jeff Bridges and Drew Barrymore. Actor Rob Lowe wore a mask as he live-streamed his family evacuating Sunday from their smoke-shrouded home. Talk show host Ellen DeGeneres tweeted that neighbors were helping each other and their animals get to safety. “I’m sending lots of love and gratitude to the fire department and sheriffs. Thank you all,” she wrote. The blaze has destroyed more than 750 buildings, officials said. It was partially contained after burning nearly 360 square miles (930 square kilometers) of dry brush and timber. Customers coming into Jeannine’s American Bakery in Montecito brushed ash from their clothes and marveled at smoke so heavy that visibility was down to just a few feet. Amtrak canceled service through the city of Santa Barbara, and its nearly 200-year-old mission church was closed because of smoke and ash. Authorities issued repeated alerts about unhealthy air and warned people to stay indoors, avoid vigorous outdoor activities and not do anything to stir up ash. Dr. Helene Gardner, an expert in air quality at University of California, Santa Barbara, watched ash fall “like a fine snow” from her home after the school postponed final exams until January. She said her environmental sciences students got a kick from the fact that the delay was directly related to their field of study. Gardner warned that the air alerts should be taken seriously because of airborne particulates — “nasty buggers” that can lodge in lungs and cause respiratory problems. She said the levels of particulates from a wildfire can approach those seen near coal-burning plants in pollution-heavy China and are especially problematic for people exerting themselves. “When I look out my window and see someone bicycling I think, ‘No, no, no, get off your bike and walk!’” she said. Forecasters predicted dry winds that spread fires throughout the region for a week would begin to lose their power Monday. 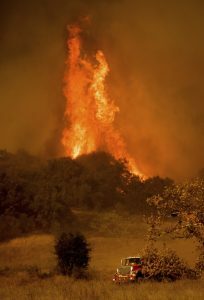 Light gusts were driving the flames away from communities, Santa Barbara County fire spokesman Mike Eliason said. But the possibility of “unpredictable” gusts would keep firefighters on edge, he said. Santa Ana winds have long contributed to some of the region’s most disastrous wildfires. They blow from the inland toward the Pacific Ocean, speeding up as they squeeze through mountain passes and canyons. 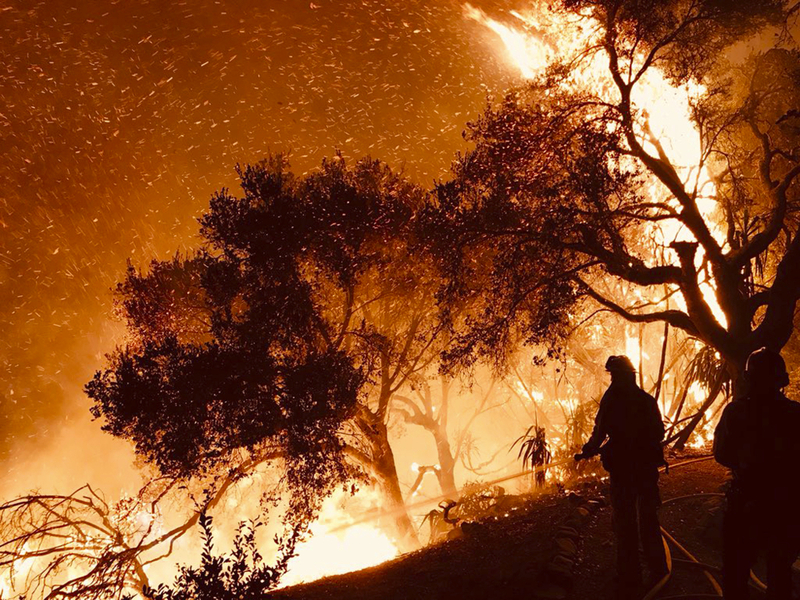 Firefighters gained more control over other major blazes in Southern California and diverted resources to the Santa Barbara foothills to combat the enormous fire that started Dec. 4. Fires are not typical in Southern California this time of year but can break out when dry vegetation and too little rain combine with the winds. Though the state emerged this spring from a yearslong drought, hardly any measurable rain has fallen in the region over the past six months.